We traditionally select red or green vehicles to feature on the November and December catalog covers to maintain a Christmas feel. I was at a local show looking for a cool, red vehicle for one of the California Car Cover catalogs when I came across a very cool 1967 Chevy Nova. 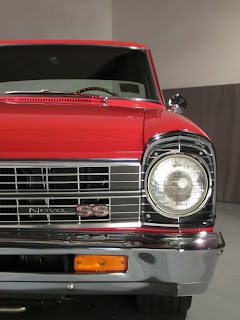 I have been a big fan of the Chevy Nova for many years and have one at home in my garage, though it is not as trick as this one. The car owner, Ricky Woolstenhulme, and I began talking and scheduled a time for him to bring the car over to the studio. I thought the Viper Red paint would look great on our catalog cover. I was glad that we could fit the photo shoot into his schedule as he is on the road quite a bit. Ricky plays drums in the rock band Lifehouse and is often on tour. Here are some of the photos from the time at our studio. The Chevy Nova has a small block Chevy engine, Ride Tech air ride, Viper Red paint and large Billet Specialties wheels. 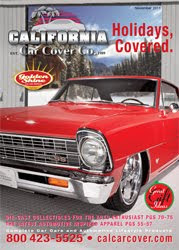 The November 2011 edition of the California Car Cover catalog. Thank you to Ricky for stopping by the studio with the Nova. For more photos of this vehicle, and all the vehicles featured on our holiday catalogs, please see our Facebook or Flickr page.